It has been a year since the Japanese earthquake and tsunami devastated the country, and The Japan Foundation are commemorating the event with a worldwide series of free concerts. These concerts are to give thanks from the Japanese people to the rest of the world for all the help and support they provided after the disaster. It is also to show how those affected are rebuilding their lives with the help and support of the global community. The musical concert features a variety of Japanese artists including 'Ondekoza', who play giant taiko drums, and 'Wakumizu Kagura', a folk group who are actually from the area affected by the disaster. The New York performance of "Overcoming the Disaster: Gratitude from Japan to the World" takes place on Tuesday 6th March at 7.30pm in the Rose Theater at Columbus Circle. Tickets to the event are absolutely free and can be ordered online or collected at the theatre box office. Located on 'Museum Row' on 5th Avenue at 103rd Street, the Museum of the City of New York offers an interesting look at the past, present and possible future of the city. The museum is housed in a beautiful building that alone is worth visiting. My favourite exhibit was "The Greatest Grid: The Master Plan of Manhattan, 1811-2011" which looks at how the New York grid system was designed and created. It was an extremely informative exhibit with lots of photographs of the city before the skyscrapers and millions of people! I enjoyed finding out what my current neighborhood used to look like and found the hand-drawn grid designs fascinating. 'Police Work' is an absorbing collection of photographs of the NYPD during the 1970's taken by the late Leonard Freed. Freed spent years following members of the police department around the city, capturing both their lives at work and home. The photographs on display show a very different New York to the one we live in today. It is an up close and personal look at the lives of law enforcement during a time when New York had one of the highest crime rates in the USA. Other current exhibits include 'Cecil Beaton: The New York Years' and 'The Unfinished Grid: Design Speculations for Manhattan', which were both interesting. I really liked this museum, it wasn't overwhelming and you can comfortably see everything in an afternoon. Admission is only $10 and I think it is worth a visit. For more information on current exhibits and opening hours visit http://www.mcny.org/. I first saw the musical 'Rent' in London over 10 years ago and thought it was great. When I heard that it was making a revival Off Broadway I really wanted to see it again. Luckily I got a good deal through www.broadwaybox.com and got tickets for $40 each. The show is playing at the New World Stages in Midtown West. It is quite a small theatre, which I prefer, and we had fantastic seats in the orchestra section. I don't know much about production, but I liked the set. It was on two levels with lots of ladders and stairs that the cast climbed up on and in-between. I thought the cast were brilliant too, especially Roger (Justin Johnston), Mimi (Ariandra Fernandez) and Angel (Xavier Cano). If you don't know the story of 'Rent' prepare yourself for quite an intense ride! It is about HIV, AIDS, homelessness, drug abuse and sexuality in the early 1990's in NYC. Although the subject matter is serious there are lots of fun scenes. It is a very moving and thought provoking show with great music and routines. I love some of the songs in the show and haven't been able to get them out of head all week. I think 'Rent' is great and the show hasn't dated even though it has been running for more than 15 years. I wouldn't recommend taking children as the subject matter might be inappropriate for them, but otherwise go and see it! For more information and to get tickets visit http://www.siteforrent.com/. Also, check out http://www.broadwaybox.com/shows/rent_nyc_tickets.aspx as you can tickets for $60 at the moment. 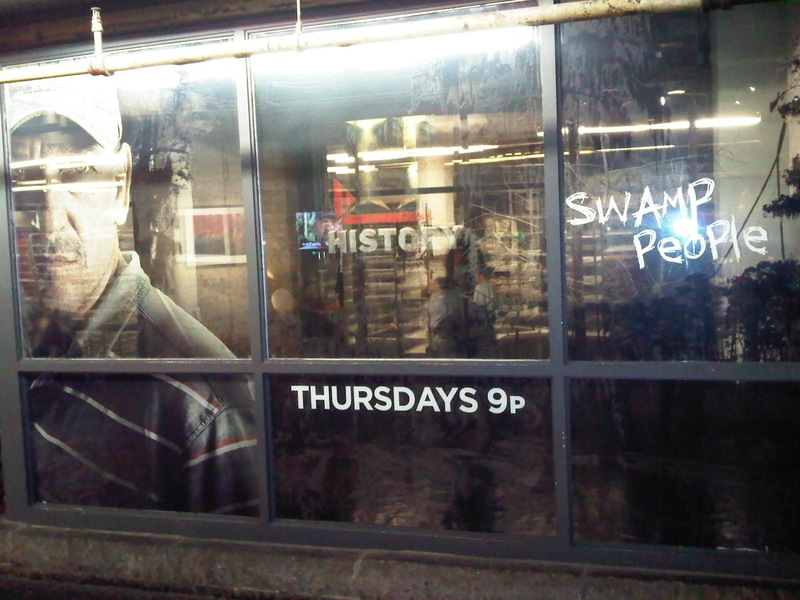 I am a huge fan of the TV show 'Swamp People', and when I heard they were turning part of Chelsea Market into a swamp with live alligators to promote the new season I couldn't wait to head down there and have a look. The 5,600 square foot exhibit contains a 6,500 gallon swamp with live alligators, turtles, Cyprus trees and other plant life from the Louisiana region. You walk out onto a small pier that overlooks the swamp and use torches to find the alligators hiding in the plant life. It was good fun trying to find them, I found two, which means I am a natural alligator hunter ;-). As well as the swamp they have live music and Cajun food tastings throughout the day. There is also a smaller alligator and turtle exhibit where it is easier to get a closer look at the creatures. However, the most exciting part of the experience was getting to meet Troy, Jacob and Chase Landry from the show! They were so friendly and it was great to chat with them, get autographs and have photographs taken. After watching them catch alligators in the Louisiana swaps it was quite surreal to meet them in the middle of Manhattan! The exhibit is completely free and runs until Sunday 12th February. The Landry guys are there tomorrow from 12-3pm. For more information on the exhibit visit http://www.history.com/shows/swamp-people/interactives/gator-cam. After being ill for most of the week (woe is me ;-) I thought it would be fitting to write about my experiences of New York health care. In the US there is no NHS or state health service, almost everything operates on the assumption that you have decent insurance which will cover any medical costs you incur. If you don't have insurance you will have to pay for every doctors appointment, check-up, prescription, hospital visit, etc out of your own pocket. They charge for absolutely every test they give you, even something as simple as weighing you and taking your blood pressure. It is vital that when you locate to or visit the US you have medical cover otherwise you could be charged a small fortune. Once you have medical insurance it can be quite confusing finding out how everything works. You will be issued with an insurance card which you should carry with you in case of an energy. Printed on the card will be the contact information of your provider. I found the best place to start was by visiting their website and finding out exactly what I was entitled to and what was covered. The next step is finding yourself a GP, or Primary Care Physician (PCP) as they call them here. Again, the website is probably the best place to start. They will have a list of all of the doctors available to you with your insurance. You can also call your provider directly and ask them to find you a PCP in your area. Some companies will make you choose just one PCP, whereas others will let you visit any doctor on the list. If you end up with a doctor you don't like, call your insurance company and ask them to switch you to someone else. When receiving medical care you may be charged a 'deductible' or 'co-pay' which is an amount you are responsible for paying at the time of receiving treatment. For example, you may be charged $20 each time you visit the doctor. These amounts should also be printed on your card. I found it very frustrating when I first went to the doctor here. I was kept waiting for an hour, the reception staff and nurses were extremely rude and unhelpful and they carried out a number of completely unnecessary tests. Needless to say I won't be going back there again! One good thing about the system here is that it is a competitive business, so if you don't like the service you receive you can go somewhere else. When filling a prescription it works very similarly to the UK, you go to a pharmacist and then pick up your medication. Be prepared that you may have pay a 'co-pay' for certain medications. Also, even though your doctor may give you a six month prescription, the pharmacy won't give it to all at once making you go back each month, which is really annoying! Like anything else, it's it difficult getting used to a new system, especially one so vital. I am slowly but surely learning how the health system works over here and hopefully be able to pass on any good tips I find along the way!